For the most part, I have had hit or miss luck with GW's Technical Paints in the past. I had the worst time with their texture paint for basing, which is sand and paint mixed together, and after a few hours of fighting it I went back to just gluing on sand and painting it. I've so far had the best luck with Typhus Corrosion for pitting on rusty metal. Needless to say, when GW announced these new Gemstone Paints I was skeptical and curious as to how well they'd work. 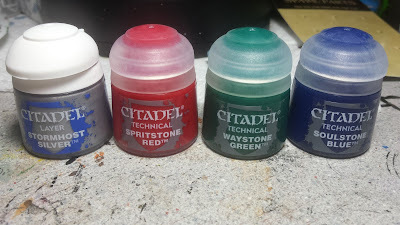 So I picked up a pot of each color, Spiritstone Red, Waystone Green and Soulstone Blue, the new Stormhost Silver and a pot of Leadbelcher silver so I could do some testing. The first order of business was to compare all of the silvers against each other on both a white and black background. 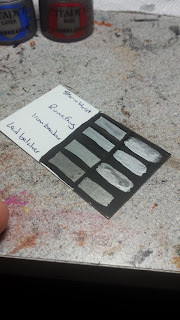 This let me see how well each compares to each other when dry on both surfaces and to see how similar Stormhost Silver is to Runefang Steel. As well as deciding which primer will give the best effect. From what I can tell, Stormhost Silver is slightly brighter than Runefang Steel, but not bright enough to use both together. Which means using one or the other for highlighting. Since Runefang seems to be widely disliked by the #warmongers community, I can see it being passed over for Stormhost. Stormhost Silver seems to give fairly good coverage when used as a base coat. But I did need to give the larger pieces 2 coats in order to get even coverage. This wasn't as big an issue on the smaller pieces though, and on the smallest ones it worked really well. Also, Stormhost Silver seemed to flow off of my brush a bit better than Runefang Steel seemed to. It also seemed to stay together better and need less shaking to keep the paint from separating. I didn't do extensive tests on the differences between the two silvers though, since I was more interested in how the gem paints worked. Luckily I had the perfect parts for testing, since a few months back I picked up some oval gem-like brads for doing scrapbooking. I had used one of them previously on the phoenix fountain terrain piece, but the rest sat in a drawer waiting for a use. Primed them with GW Chaos Black spray and then split them into groups of three, with two spares for other testing. The first batch of tests involved using single base coats of each, Leadbelcher, Ironbreaker and Stormhost Silver, then laying the gemstone paints over top of each. This way I could see how each shade of silver affected the end result. The left column was painted with Leadbelcher, the middle column with Ironbreaker and the left with Stormhost Silver. Each was then painted with 3 coats of gemstone paint to get even coverage. Then I finished them off with some Retributor Armor gold and a brown wash, just to finish them off a bit. Out of all these tests, I liked the Leadbelcher set the most. It seemed to me to be a richer color than the other two. But, I wasn't happy to leave it there. I wondered what would happen if I painted all three onto one gem in the same way the "old school" gems were painted, with a dark upper section, gradually lighter at the bottom with a highlight in the bottom corner. So I grabbed another set of gems, this time smaller ones and painted them in a gradient from Black to Leadbelcher to Ironbreaker, with a lower highlight of Stormhost Silver. While these were smaller, they still needed 3 coats to get even coverage. The end result was great and I am a much bigger fan of these as the variation of shades of silver help give it much more depth. But what happens if we don't use metallic silver paint underneath and instead went for reds, blues and greens? With that in mind I pulled another set of gems out and painted them the old school way with black up top and colors brightening up to a bright highlight in the bottom. Though, without the light source white dot at the top. These turned out well also, but, I feel like they need more blending from one shade to another to make them really pop. But this each work seems to be counter to the purpose of the gemstone paints. 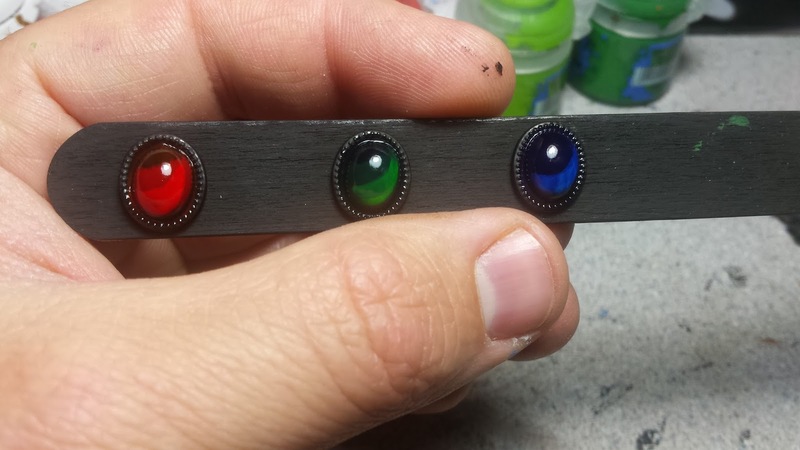 If you're going to take the time to blend colors, you might as well paint the gems the "old school" way and skip the gemstone paints, since they don't really add a whole lot to the final effect, other than tying the black in with the colors better. With all those tests done, it was time to try it out on some actual models. 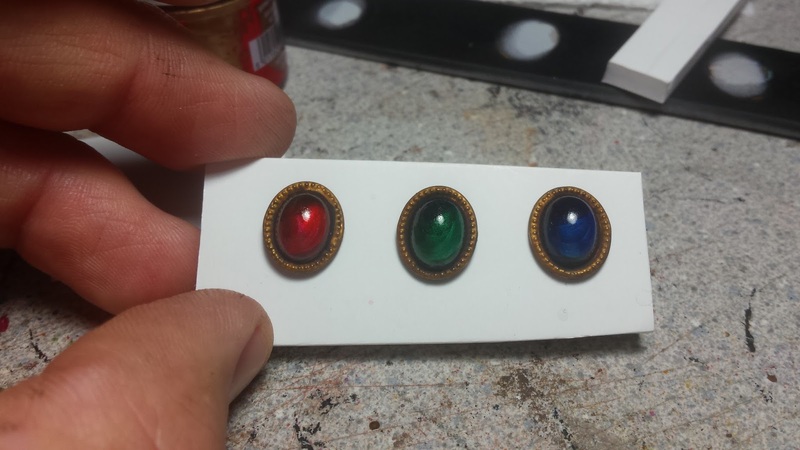 For these ones, I painted the gem on the head dress with straight Stormhost Silver and then covered it with Spiritstone Red, the lower gem along with the blue and green gems were painted using the gradient silver method. All of them turned out great, but I am definitely not a fan of straight silver under the gemstone paints, even in this smaller scale. The gradient adds so much more depth, its not even comparable for me. 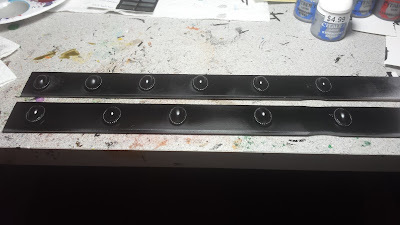 One final test I wanted to try was to see what happens when you spray them with matte varnish. So I made one more gem with the gradient and some Spiritstone Red and once it was dry, I covered it with two coats of Testors Dullcote. The image to the right shows the before and after. It seems to me that it's still looks good and could still be viable for gems, even if you don't want to go back and regloss all of your gems on the model. Especially with the gradient and it keeps the depth. I'm unsure if it would work out the same with the suggested Stormhost Silver base coat with gem paint over top. But I have a feeling that it would just look like a slightly dulled metallic solid color , based on my experience with dullcote and metallic paints. I've finally gotten the videos of some of the tests added to youtube. Here they are, so you can see the effects as they move. That's all for the testing. 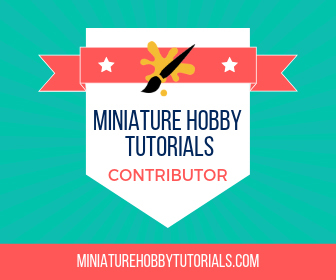 It's time for some final thoughts on these new Gemstone Paints. So, what do I think about these? I do like them, there are a few issues with them compared to the old way of doing things though. First up, they only come in red, blue and green. I would like to see some other colors, like yellow or purple. Luckily purple is easily made by mixing together Spiritstone Red and Soulstone Blue and the shade is actually pretty nice as well. Also it seems like these paints are actually just gloss medium with color added, so it may be super easy to make new colors by mixing washes into pots of Citadel's 'ardcoat gloss coating. Depending on the surface area, one coat will not cut it and it tends to streak a bit when spread over larger areas. 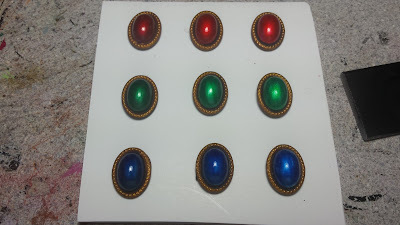 On all of my large gem tests, it needed to be coated 3 times in order to get even coverage and uniform color. But on the small model size gems I managed 1-2 coats depending on the color and streaking wasn't an issue. They seem to take awhile to dry and remain tacky for awhile, not being fully cured until the next day. Until then dust and dirt are your arch-nemesis and will cling to the surface of your gems. But after they are dry, the surface is smooth and no longer sticky. 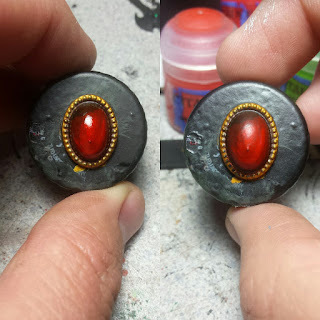 From what I can tell, the suggested way of painting with these is to paint the areas with Stormhost Silver and then a coat of Gemstone. While the gloss of the paint and the metallic undercoat help it shine, there isn't much depth to it. It should help beginners with painting gems, but more experienced painters will want more detail and that s why I went with the gradient of silvers underneath. 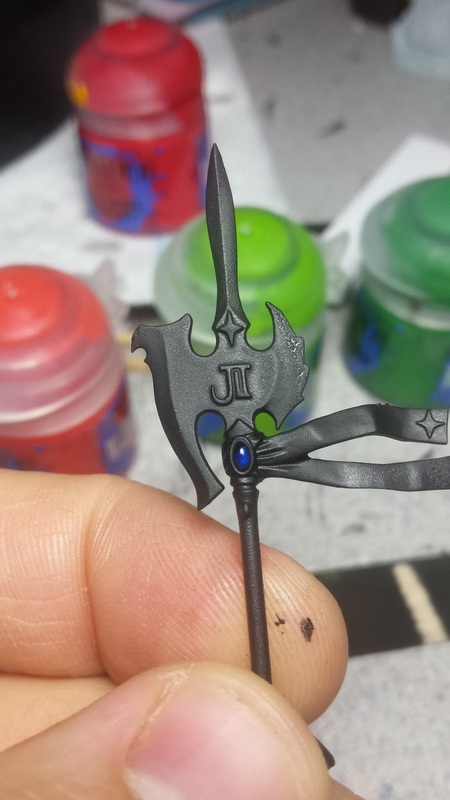 If I was going to paint them over a single color of silver, I would go with Leadbelcher, since it's a bit darker and adds more depth to the gem. But 9 times out of 10, I'd paint the gradient underneath instead. Painting similar colors as the gem coat for the undercoat seemed like it was neat. But it needs smoother blends to make the effect really pop, unless its on a very small gem. 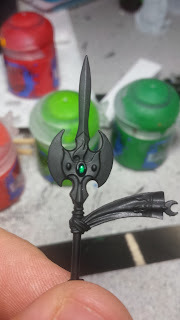 That said, if you're going to do the work blending colors and making it a smooth transition from one to another, you might as well paint gems the "old school way". One more thing, all this glossy gem coating is nice and all. When you matte spray, that means going back over them with 'ardcoat to bring the shine back in. Luckily, if you use variation of silvers in the undercoat, they still look good. But without, it would definitely need to be reglossed. Unless you want to save all your gem coloring for after sealing. But that means precise brush control, with a liquid that is thinner than paint, but thicker than wash. I know it sound like I am being negative, but there are actually a few things I like about these too. I really like the effect these give, if you take the time to work the surfaces. I can see myself using these for future display pieces in lieu of the old way of painting gems. But for something like Super Dungeon Explore, I've already painted countless gems on those minis, I can't switch it up now without going back and redoing them all. If I did use these for gems, I would always do the silver gradient undercoat, the final effect is too good not to. Using silver under the gloss coating gives a really nice sheen and even though they are called Gemstone Paints, I can see these getting used to simulate metallic vehicle paint, control panel button and maybe even display panels for cockpits. Really, these have my brain wandering all over the place thinking of ideas and places to use them. 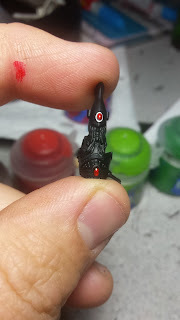 The whole time I was testing theses, folks were messaging me on Twitter bouncing ideas about how to possibly use them with decals underneath, or other types of designs in the undercoat using the different shades of silver or using them for Space Marine's eyes.. These paints seemed to have sparked imaginations with the warmongers. Overall, I think that these are some really solid technical paints. They won't magically make all the gems perfect with a single application, but with a bit a finesse and extra work it gives a nice effect that is different from the standard way of painting gems. Even with a few issues, I'd say the new Gemstone paints from Games Workshop are a win and are a good addition to the technical paint line. It would be nice if these came in more than three colors, and I would have preferred to have the third color be yellow instead of green, so we could easily mix them all to get the secondary colors out of them. But if it really is just 'ardcoat mixed with washes, it could be really easy to make some custom colors. Until next time, but til then you can catch me over on Twitter and Instagram. Stay tuned! Nice review, grabbed some. If you paint or want red gem did discover a similar trick with 'Blood for the blood god.' Paint gem red, add white spot, and dark red shade, with second black shade, then over paint with the Tech paint BFTBG, gives a really good 3d gem effect. I'll have to give that a try. I have 2 pots of BftBG that I've never opened, since I don't do blood effects very often on my minis. Just phenomenal work on this review scott. Thanks so much for doing this for everyone! Thanks for the review and use a a couple of times with the 3 silver trick. Works well. The Dull Coat issue, You have two tricks here. 1. if you go over with GW 'Ard Coat brings it right up with a shine/gloss. 2. Give two coats of the gem medium, varnish, dull coat and once dry go over with the third coat, and it recovers with a shine/gloss. Great review. Do you think this method could be applied well to a Fire Prism as well with it's massive focus gems? Thanks! I think it would work well, if you're doing the silver gradient underneath, you may need to mix some silvers together to make sure that your transisions from dark to light are more smooth. But I'd say give it a try. All my examples are on large scrapbooking gems, so I don't see why it wouldn't work out for the Fire Prism. Hi! I was curious what this part looked like - I didn't see a picture up top and as a new painter the pictures really helped. "So I grabbed another set of gems, this time smaller ones and painted them in a gradient from Black to Leadbelcher to Ironbreaker, with a lower highlight of Stormhost Silver. While these were smaller, they still needed 3 coats to get even coverage. The end result was great and I am a much bigger fan of these as the variation of shades of silver help give it much more depth." Is there any chance you still have pictures of this part?